After India restricted South Africa to 204 all out in the sixth ODI on Friday, courtesy Shardul Thakur's 4/52, Kohli scored an unbeaten 129* in 96 balls as the visitors won by 8 wickets in 32.1 overs. That's it! Kohli hits Tahir for a straight boundary to signal India's 8-wicket win and 5-1 series triumph. 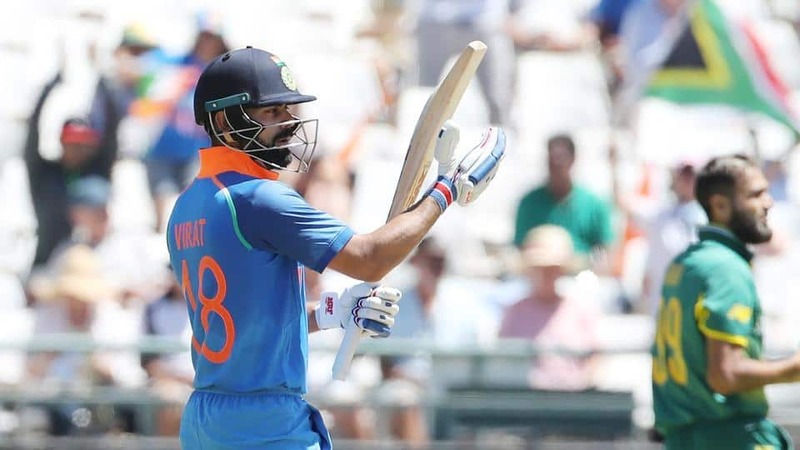 After the visitors restricted South Africa to 204 all out, courtesy Shardul Thakur's 4/52, Kohli scored an unbeaten 129* in 96 balls as the visitors won by 8 wickets in 32.1 overs. Rahane remained unbeaten on 34 runs. South Africa going through the motions as India look to knock off the remaining 25 runs in quick fashion. 180/2 in 30 overs. VIRAT KOHLI brings up his 35th ODI century with a straight boundary, took just 82 balls. Has there ever been a purple patch like this? Third century of the series, fourth of the tour. What a player! India 165/2 in 27 overs. 1. First batsman to score 500 runs in the history of bilateral ODI series, going past Rohit Sharma's 491. 2. Tops the list of most runs by a captain in a bilateral ODI series, going past Australia's George Bailey (478). Meanwhile, India cruising towards 205. Currently 136/2 in 21.3 overs. Imran Tahir being brought into the attack, but at 118/2 in 18 overs and Kohli batting on 62 off 47 balls, the writing is more or less on the wall for South Africa. 5-1 looks like a mere formality now. India's 100 comes up in 14.3 overs and is followed by Virat Kohli's 47th ODI half-century in just 36 balls. Rahane too has begun in a busy fashion, scoring 12* off 10 balls. India 106/2 in 15.3 overs. Ngidi gets his second wicket. Dhawan (18) is unable to keep his cut shot down and Zondo takes the catch after a little fumble. But Kohli is looking unstoppable at 42* off 30 balls. India 85/2 in 13 overs. There are wheels beneath India's chase now as the scorecard reads 73/1 in 11 overs. Kohli the aggressor at 37* off 25 balls with six fours, Dhawan on 12*. Both Morkel and Ngidi have given away 32 runs apiece in their five overs each. Kohli (23 off 13) hits Ngidi for two consecutive pull shots for boundaries to bring up India's fifty in 7.5 overs. SA's short-pitch tactics not working against India captain. 53/1 in 8 overs. South African bowlers focused on not pitching anything up to Dhawan (5*) and Kohli (14*), but so far it's producing runs, not wickets. Kohli, especially, looking to hook and pull at the slightest opportunity as he showed in two consecutive fours off Morkel in the 7th over. IND 42/1, chasing 205 to win. Out! Ngidi strikes to dismiss Rohit. The ball climbed on the Indian opener who tried to go for a hook but could only get a glove to it as the ball lobbed off to wicketkeeper Klaasen. India 19/1 in 3.4 overs, chasing 205 to win. Rohit (13*) has started with a bang, hitting Morkel for two fours in the first four, although one of those was an edge that flew through the slips. The other was a slash over point as Rohit was offered width. Dhawan a little sedate at 2* off 8. India 16/0 in 3 overs. ALL OUT! A brilliant diving return catch by Thakur (4/52) gives him his fourth wicket and helps India dismiss the hosts for 204 in 46.5 overs. Zondo was the top-scorer for South Africa with 54 but Indian bowlers, led by Thakur, continued to strike at regular intervals and eventually dismissed SA inside 50 overs. Chahal & Bumrah took two wickets each, while Pandya and Kuldeep took one apiece. Kohli takes a diving catch, his second of the match, to get rid of Imran Tahir (2). Bumrah gets his second wicket, leaving the hosts just a strike away from being bowled out. SA 192/9 in 46 overs. Morkel (20) frustrated India for a while but finally managed to find Iyer at deep point and give Pandya his first wicket. Phehlukwayo batting well at 20* but the hosts are eight down now for 187 in 43.4 overs. Chahal collects his third wicket, almost. Morkel's attempted sweep missed the ball that went on to hit his front pad. He decided to take a review and was saved by the turn as the ball-tracker showed it to be spinning and missing the leg-stump. Aleem Dar has to change his decision to not out. SA 160/7 in 39 overs. Chahal ends the set man Khaya Zondo's (54) stay. This could end South Africa's hopes of reaching 200, or even playing out the full quota of 50 overs. Caught in the deep by Pandya. SA 151/7. A soft dismissal for Chris Morris (4), who doesn't get the kind of connection he would have liked as he tried to go big against Kuldeep. Simple catch in the end for Shikhar Dhawan running in from long-off, and he follows it up with his signature Punjabi-style thigh-slap. SA 143/6 in 34 overs. Wicket No. 3 for Shardul Thakur. He can hardly put a foot wrong today, but tremendous support from fellow fast bowler Bumrah at the third-man fence, as he pouches a smart effort - almost one-handed in the end. Behardien (1) attempted to guide Thakur over third-man boundary but couldn't beat Bumrah who dived to his right to take the catch. SA 136/5 in the 32nd over. But Zondo completes a well-deserved fifty as the lone warrior. Stupendous low catch by Kohli at short cover ends Klaasen's stay at 22. Just when the Zondo-Klassen stand started looking good, Bumrah removes the SA wicketkeeper. SA 135/4 in 31 overs. There's been a serious brake on South African scoring. Just 12 runs in the last five overs. Klassen struggling at 9 off 26 balls, while Zondo is 46 off 59 balls. SA 121/3 in 28 overs. Chahal gets the biggie! AB de Villiers (30) is foxed by a flipper as he goes back to cut but the ball zips off the surface to beat his bat and onto the stumps. South Africa 106/3 in 21 overs. Klaasen comes in to join Zondo (39*). Remember, no Duminy or Miller in the SA XI today. 106/3 in 21 overs. Zondo given out lbw but goes for a review straight away. Saved by a shave off the glove before the ball hit his front pad as he tried to sweep a fullish delivery from Chahal. And Zondo (36*) celebrates it with a pulled six next ball, followed by another biggie in the same area two balls later. Brings up South Africa's hundred as well - 100/2 in 19 overs. De Villiers shifts gears, and swiftly. Three consecutive fours off Yadav. A square-driven boundary followed a lucky one behind Dhoni as the ball spun in sharply to take an inside edge. It followed ABD at his cheekiest best, reverse-sweeping for four to reach 28 off 29 balls. SA 88/2 in 18 overs. Khaya Zondo (20* off 25) hits Yadav for back-to-back boundaries - first a straight hit off a full toss and then a neatly-hit sweep. He's looking good, while De Villiers (11* off 22) is taking his time to get his eye in. SA 67/2 in 16 overs. Legspinner Yuzvendra Chahal pressed into the attack now. First sign of spin as Kuldeep Yadav completes the 12th over. He took 4/57 in the last match, and De Villiers and Zondo will take their time before they think of taking on the chinaman bowler or even milking him. The subsequent first ball of the 13th over brings up SA fifty - 50/2. After a thunderous six over square leg, Markram (24) lets another good start slip away. Thakur, after being brought on from the opposite end, gets the SA captain to drive in the air and Shreyas Iyer takes a good leaping catch in the covers. SA 43/2 in 9.6 overs. Zondo the new man in. Virat Kohli brings first change, replaces Shardul Thakur with Hardik Pandya in the ninth over of South African innings. Thakur's first spell read an impressive 1/22 in 4 overs. Meanwhile, AB de Villiers has begun on his characteristic aggressive note, hitting a boundary in his 6*. SA 33/1 in 8 overs. Oops! Spoke too soon! Thakur strikes but in a soft manner. Amla (10) would feel gutted to see the ball brush his glove as he tried to play an awkward hook off a bouncer that was going down the leg side. Dhoni takes an easy catch to send the right-hander on his way. SA 23/1 in 6.3 overs. Markram is getting a hang of Bumrah and Thakur, as the three boundaries in his 12* off 18 balls suggest. Amla isn't too far behind at 10 off 18, including two boundaries. South Africa should, thus, be happy with their 22/0 in 6 overs. Shardul Thakur starts the proceedings for India and concedes a four off the second ball of the over to Aiden Markram. There is one more, very similar to the first one, cuts it between backward point and cover. The last three balls yield no runs. South Africa 8/0 in 1 over. Not the start Thakur would have wanted for himself. India: Dhawan, Rohit, Kohli (capt. ), Rahane, Iyer, Dhoni (wk), Pandya, Kuldeep, Shardul, Bumrah, Chahal. South Africa: Amla, Markram (capt. ), De Villiers, Zondo, Behardien, Klaasen (wk), Morris, Phehlukwayo, Morkel, Tahir, Ngidi. So here is the toss update. India win the toss and decide to bowl. One change for the Indians. Bhuvneshwar Kumar has been rested and in comes young pacer Shardul Thakur. South Africa meanwhile make four changes to their team. Chris Morris, Khaya Zondo, Imran Tahir and Behardien are back for them.